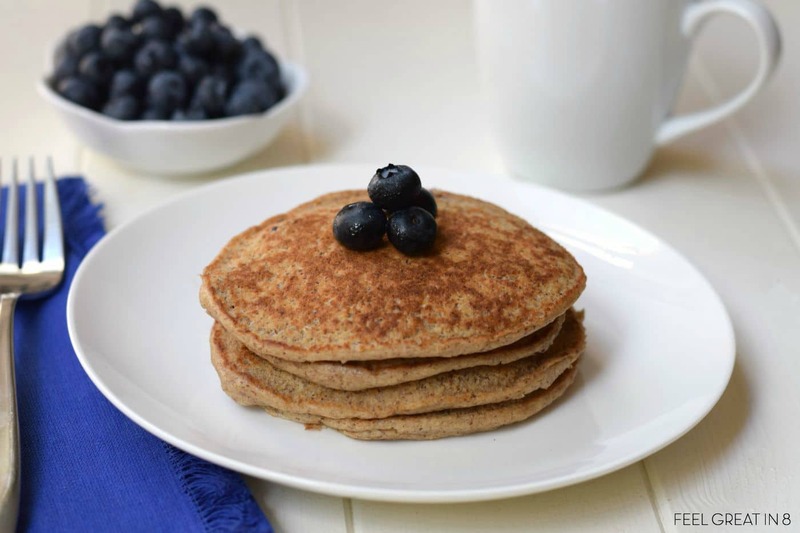 These quick, easy, and delicious Brain Booster Pancake Recipe is high in protein, fiber, and omega 3s – the perfect start to your child’s day! One thing I have already started thinking about is how to make this year a successful one for my kids. We got into a little bit of a breakfast rut last year, stuck having the same 2 or 3 meals on repeat. So, this year I’m already testing new simple recipes to make our mornings more exciting. This pancake recipe experiment has definitely been the favorite test so far! I’m excited to add these to our breakfast rotation this year. 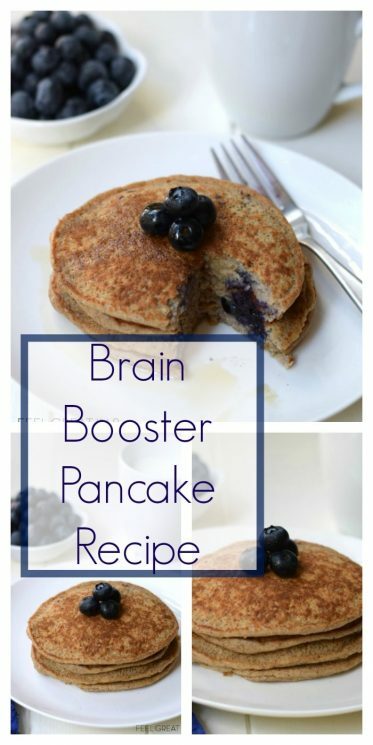 I nicknamed this recipe Brain Booster Pancakes. They have everything your child needs to focus and be ready for a successful school day. The protein and fiber will help keep your child feeling full! Studies show that omega 3s can improve mental skills, like thinking, remembering, and learning. These pancakes are also gluten-free (just make sure to get gluten-free oats) and refined sugar-free! It only takes a few minutes to throw all the ingredients into the blender! Quick, easy, and healthy … It doesn’t get much better than that! 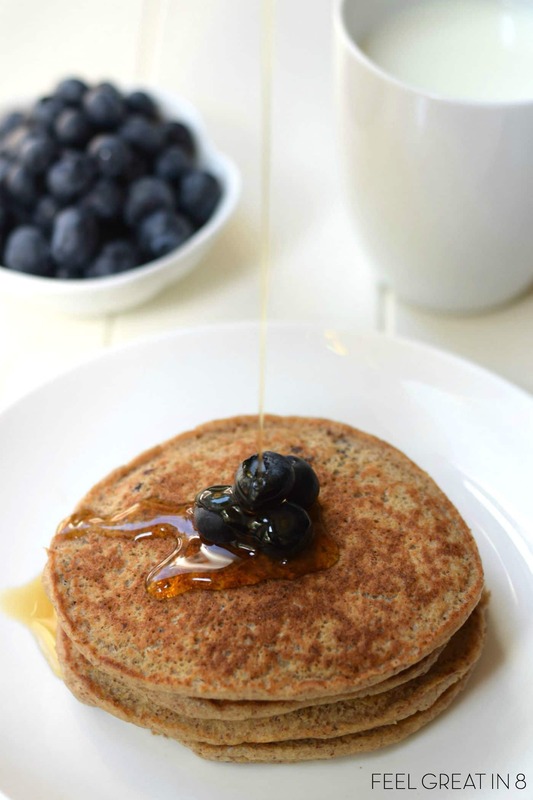 Add some extra blueberries on top and a little drizzle of pure maple syrup. I bet the whole family will devour these pancakes! Yay for healthy food and especially healthy breakfasts that taste good! Looking for some more quick, easy, & healthy real food breakfast recipes? You can find more of my favorites (including Healthy Homemade Pop-Tarts) and how to make mornings easier in this post – Healthy Breakfasts to Last a Month…in Less than 2 Hours!! – Tiffany is a wife, mom of 4, foodie, dark chocolate lover, creator. She’s also host of the Feel Great in 8 Challenge, and blogger at www.feelgreatin8.com. She loves experimenting in the kitchen and creating healthy real food recipes. Place all ingredients, except eggs, coconut oil and blueberries into a good quality blender. Blend until oats are ground and everything is mixed well. Add eggs and pulse until incorporated. Heat a griddle over medium heat and melt a teaspoon or two of coconut oil or butter. Pour about 1/4 cup of batter onto the griddle for each pancake. 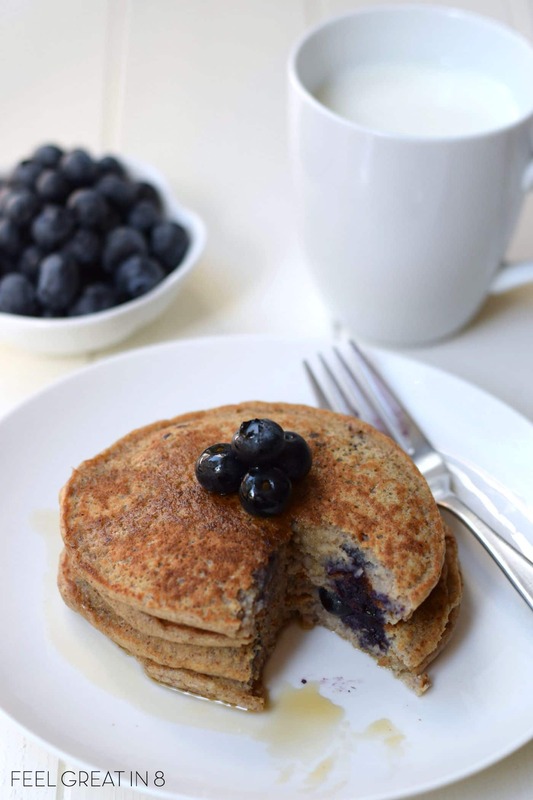 Drop 3-4 blueberries onto each pancake before flipping. 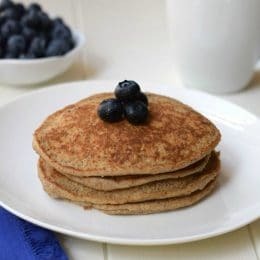 Brown on both sides (about 2-3 minutes per side) and serve hot with more blueberries and pure maple syrup. If the batter is too thick to pour, add a tablespoon or two of almond milk to thin. Hey Stephanie!! I’ve never tried them without the banana, but you may be able to replace the banana with 1/3 cup of apple sauce. Hopefully that would give you the same texture and added sweetness. Come back and let us know if you try it! If I wanted to make these vegan, what would you recommend as my egg substitute? Egg replacer, more ground flax, chia seeds, etc? Do you think this recipe would work to make waffles in a waffle maker? Thanks. I’m curious about all the warnings I’ve read about not cooking with flax seeds — the heat apparently creates funky unhealthy byproducts. What’s your take on that? And is there an appropriate substitute for this recipe? It looks delicious! Could you freeze the pancakes and reheat in the toaster? Mornings are rough in our house and every little shortcut helps. Thanks for all your great ideas. My batter was thin. Did I do something wrong? Oh no, sorry about that Jane! It might just be different locations/humidity, I usually have to thin mine a little. Next time just start with 3/4 cup almond milk and add more until you get the right consistency. The batter will also thicken as it sits. I hope that helps! My daughter has a tree nut allergy. Can I replace the almond milk with regular milk? Would that be true for most of your recipes? Homemade) and they ate it up! 4 and 2 year old approved! Thank you!! I made the today for my 15 month old and she loved them. So did mummy and daddy. Thank you for the receipe. My 4 year old and 2 year old loved them, and we’ve allowed way too much Halloween candy this week and I thought they might taste too healthy. I did need about an extra 1/4 cup of milk. Can you make a whole bunch of them and freeze for later use? Such a great alternative to box mix. The whole family loved them. My family love this recipe … it is our new favourite weekend breakfast treat. Made these this morning and my 6 year old daughter loved them!. She said they were the best pancakes ever. Thank you for the recipe. I made these. 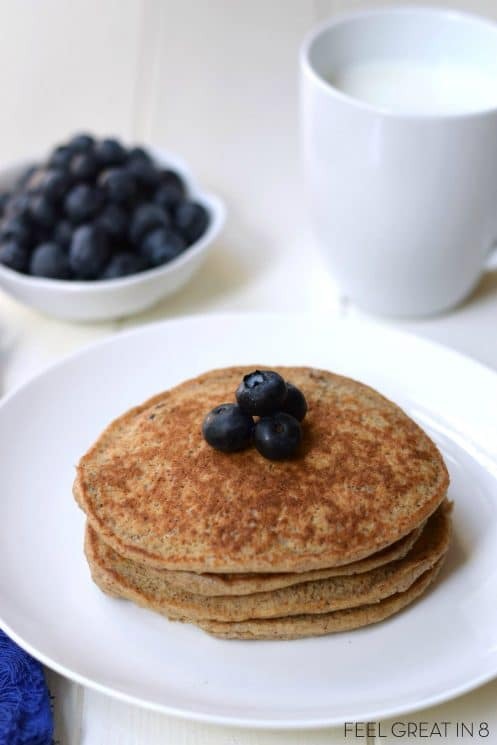 I changed a lot of stuff – I replaced the flax seeds with chia seeds, added a little over 1/3 cup sugar, added 1/2 cup buttermilk, changed the vanilla from 1 teaspoon to 1 tablespoon, and added 1/3 cup flour. I didn’t have bananas, so instead i used 1/4 cup of almond butter. I also replaced the coconut oil with 2 tbs melted butter. I added in some chocolate chips, too. Definitely not the healthiest changes, but tasted great! It seems like a lot of adjustments, but was well worth it. I felt SO energized and healthy in the morning, and it was great! It helped my brain function a lot less groggily, and I think it helped me to well on the test. Crazy but I really think it made a difference! will certainly be making these again!